Hello everyone, and welcome by my little piece of blog land. Today, along with my talented Paper Sweeties teammates, I'm sharing a sweet little card I created using a few of my most favorite products from Paper Sweeties using previously released products. And trust me....there are SO MANY from which to choose. LOTS of great stamp sets, sweet cuts (dies), seam binding, embellishments, and more. Here's what I came up with for today's post. This card uses the adorable Emma and the coordinating Emma Sweet Cut. Once I stamped and cut Emma, I colored her with my Copics. Then, I knew she needed a sweet little Spring/Easter dress, so I used the Jelly Bean Time stamp set (my favorite outfit) to create her beautiful dress and shoes. 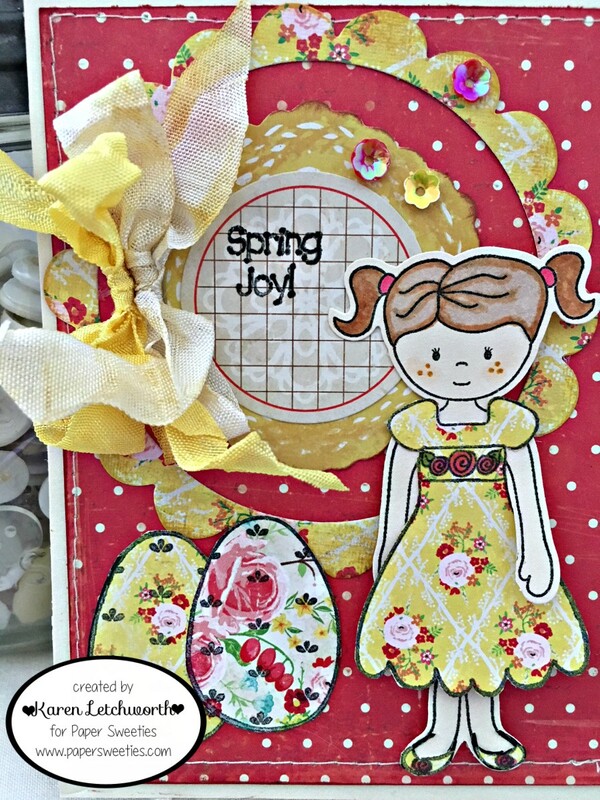 I also used the Jelly Bean Time set for the sentiment (Spring Joy!) and the Easter eggs. I also cut the largest circle found in the AWESOME Circle Scallop Frames Sweet Cuts. The finishing touches include a bit of machine stitching, some Cookie Dough Sequins, Raspberry Sequins, and a sweet bow tied with Cookie Dough Seam Binding and Oatmeal Seam Binding (inked with Fossilized Amber distress ink). Here's the complete list of all my amazing teammates who have prepared something ADORABLE for you today; and we will all be back again tomorrow and Friday with more inspiration. 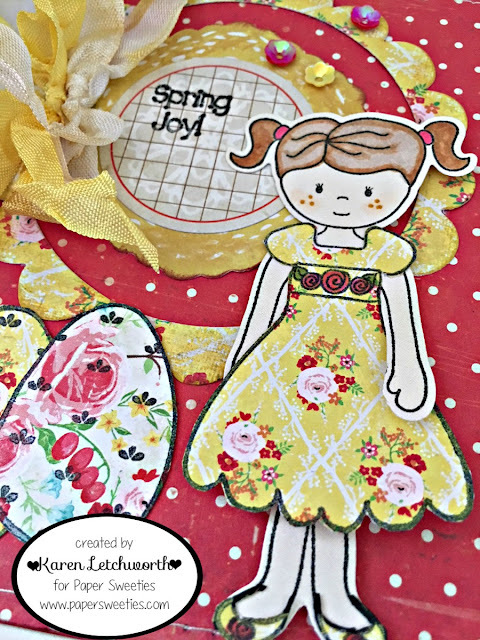 Just click on the links below, and you will be taken directly to each of their blogs to see their fabulous art work using some of their favorite Paper Sweeties products. Karen, this is so sweet. Love your paper piecing and those papers. 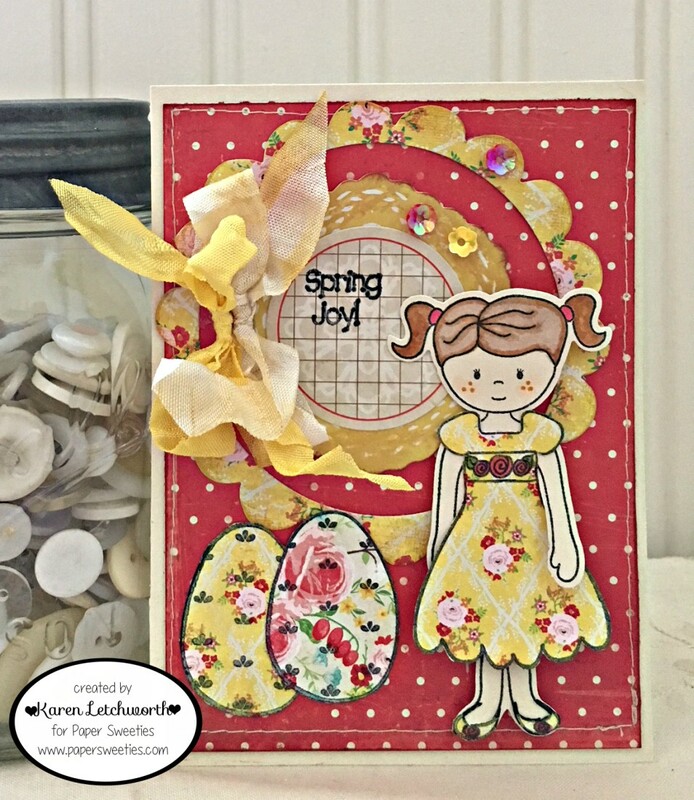 I love everything about this romantic easter/springcard! I love Emma! She is just darling!! A beautiful card my friend! Love this little piece of ART, Karen! Thanks so much for playing Simon Says Stamp Wednesday “Easter Inspired” Challenge! Beautiful colors and design. Well done!